How Important is it to be Trendy? It is tempting to want to be on-trend, for sure. It’s also tempting (I would think) for grandparents and others to want to help the children in their lives keep up with trends so they fit in with their peers. Trends, however, come and go. The value of a college education lasts forever. The value of an education will, I promise, last longer than bell bottoms, jelly shoes or Farrah Fawcett hair. Florida Prepaid plans lock in tomorrow’s tuition for less with guaranteed plans starting at $47 per month. I am so grateful that my parents purchased prepaid plans for my children when they were infants; it has taken away much of the stress of helping pay for their college educations (especially with two in college at the same time). What if My Kid Decides Another State is Trendier than Florida? One misconception I have heard throughout my time as a Believer Blogger is that a child has to remain a Florida resident to retain the Florida Prepaid benefits. If a Florida Prepaid beneficiary moves out of Florida after purchasing a Prepaid Plan, the child will still be billed at in-state tuition rates when using their plan at a Florida college or state university. The “Resist Trendy” Clock is Winding Down! Open enrollment for Florida Prepaid ends February 28, 2018. Don’t be “last year’s style,” banished to the clearance rack of life planning. Invest in a child’s education today and you won’t ever have to worry about a poor fit or busted seam. Learn more from this webinar held Tuesday, February 20, from 12-12:45 p.m. ET. The Florida Prepaid team and Florida Prepaid advocate Cristy Clavijo-Kish discussed how families have been using Florida Prepaid for over 25 years to send their children to college. Get a firsthand perspective on how to get started and how saving early can make a difference in your child’s future success. Your kid is bound to look at least trend-adjacent (I’m betting even trendy!) in a t-shirt representing their university once they enroll under a Florida Prepaid plan. It’ll be a much more comfortable fit than crushing debt. When I had the opportunity to attend the Social Good Summit in New York City recently, I was not surprised to hear the trendy word “disrupt” uttered in more than one session. Elizabeth Gore, Entrepreneur-in-Residence at Dell, used the word “disrupt” in both of her panels, Enabling Entrepreneurship Everywhere and Tech Disruptions for a Sustainable Future. It’s one thing to disrupt business models worldwide in order to make it possible for the economically disadvantaged to do business and for technology to improve quality of life across the board, but it’s another thing to turn the idea of disruption around and direct it inward. 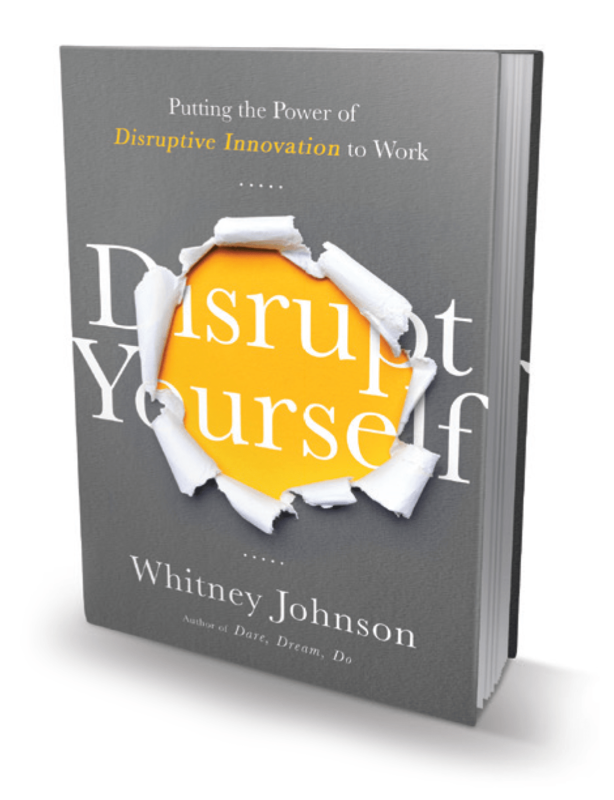 In Disrupt Yourself, which is being released on Tuesday, October 6, Whitney Johnson explores disruption for individuals. She is someone I have respected and followed for years; it is my privilege to host a guest post by her here at Perspicacity. As a professional, you should constantly be engaged in the process of re-evaluating your portfolio of skills and leading with those that are unique — your disruptive skills. These may be capacities that are so innate you may not even consciously recognize them, or skills you have honed over years of practice. These are the skills that can help you carve out a disruptive niche — consequently upping your value in the marketplace. But how do you identify these skills? Or as one reader queried on Hacker News, “How do you identify the skills that disrupt others’ previously-established judgment of your worth to them?” This is a subject I’ve researched and thought deeply about; readers of my last post also left some great advice. Here are three questions to get started. What do others identify as being your best skills? Neil Reay, who also weighed in on the previous post, wrote that when he asked for recommendations on his LinkedIn profile, “several things that others said about my strengths were not the things I was using as “Core Skills” in my own profile, but were valuable to those around me.” Sometimes what we learn about our core skills isn’t what we want to hear, like the fourteen year-old who is told he’s built to be a long distance runner rather than a football player, as he aspires to be. Sometimes, however, the assessments of our colleagues and friends will actually surprise and delight us. A well-respected author who is a family friend told me he couldn’t wait to see what I was going to accomplish over the next decade. To him, it was probably just an offhand remark, but for me it was a real confidence booster that he saw me as someone with potential, a do-er. Identifying and deploying your best skills can be a game-changer for your career. Not necessarily because employers will suddenly decide to pay you more, but because accurately valuing ourselves is foundational to disrupting others’ perception of our worth. When you recognize your greatest assets — your disruptive skills — you are on your way to taking stock in you. This post was originally published at The Harvard Business Review on 10/04/2010. If you are intrigued by Whitney’s approach to disruption (and I’ll bet you are! ), please join her for a webinar on Wednesday, October 7, at noon ET to learn more. Click here to register! Whitney Johnson is the author of Disrupt Yourself: Putting the Power of Disruptive Innovation to Work, and Dare, Dream, Do. Additionally, she is a frequent contributor to the Harvard Business Review. Learn more about her at http://www.whitneyjohnson.com/ or connect with her on Twitter.